How do you adapt to a brand new family member from a different culture? Director Stephanie Wang-Breal’s first feature film film “Wo Ai Ni Mommy” (“I Love You Mommy”) breaks important ground as she travels to Guangzhou, China with adoptive mother Donna Sadowsky of Long, Island, New York, to meet her 8 year-old daughter, orphan Sui Yong (“Faith”) for the first time. Wang-Breal acts as a fly-on-the wall documentarian, capturing the moment by moment complexities of forging a loving and healthy bond with an older child from another culture. While over 70,000 children have been adopted from China into the U.S. since 1992 and everyone’s experience is different, this story is unique. It is told in real time and captures the child’s perspective, often in her own voice. Most adoption documentaries are told from the perspective of the adult adoptee looking back in time or the adoptive parents’ experience or even the relinquishing birthmother’s point of view. This one is straight from the psyche of an 8-year-old who was abandoned as a 2-year-old and has been living at the orphanage and in foster care. She has never seen a Caucasian before but has been told by a kindly Chinese social worker named Leila that she is going to have a good life in a place called America. As the film unfolds, nothing is held back. We first meet the Sadowsky family in Long Island. Jeff and Donna have two teenage sons and a 3-year-old Chinese daughter, Dara, who was adopted at age 14 months. The decision to adopt another child was agreed upon by all family members and everyone’s view seems to have been respected. The action then moves to China with Donna in her hotel room, a few hours before she is going to meet her new daughter, Sui Yong. Her elderly father has made the journey with her. Her husband Jeff made the difficult decision to stay at home and care for the rest of their children so that Donna could devote her full attention to Faith. Donna is anxiously preparing stacks of hundred dollar bills and organizing gifts for the orphanage. Sui Yong’s care for 6 years has been subsidized by the Chinese government and Donna is paying $3,000, a pittance compared to costs in the US. At the Guangzhou Civil Affairs Office, the first meeting between mother and daughter unfolds in the chaos of what appears to be a dozen similar introductions taking place all at once. The tension is palpable. A social worker carefully handles the introduction and Sui Yong is asked what she thinks of the name “Faith.” She is then told that she will now be called Faith and she should call Donna “Mommy.” She is told many times that Donna loves her and that she will come to love her Mommy too. As Donna gives her daughter her first hug and pulls her into her arms, Faith is stoic, shell-shocked. When given the chance to ask Donna questions, she asks only one—does the Sadowsky family eat fish. To which Donna answers yes, “We like fish.” A smile emerges. What follows is a linear narrative—tracking moments of happiness, ambivalence, sheer fright and acting out, an unexpected meeting with Faith’s Chinese foster family, traveling back to Long Island where Faith meets the rest of her new family, and her subsequent struggles to integrate into family life in America. Language, food, habits—everything Faith has known as young Chinese girl vanish as she struggles to adapt to boisterous Jewish family life. Donna is a no-nonsense mom and establishes boundaries and expectations right away–Faith must learn English to communicate and she needs to learn to share what’s going on inside so that her family can understand her needs. Dad Jeff is a very loving father who is keenly aware of the impact of his smallest gestures of affection or discipline and is very careful to treat all his children equally and with sensitivity. Over the course of 17 months, we gradually witness Faith’s transformation into a lively, outspoken American child. Rapid immersion has had a remarkable impact– there is a noticeable set of cultural gains and losses and actual shifts in her personality and identity. She moves differently, has different expressions and attitudes and now identifies herself as American. Sadly, she has nearly forgotten her native Cantonese language but wants desperately to communicate by Skype with her beloved foster sister in China. Of particular interest is the rare footage of adoptive mother Donna meeting Faith’s Chinese foster mother and family in China. 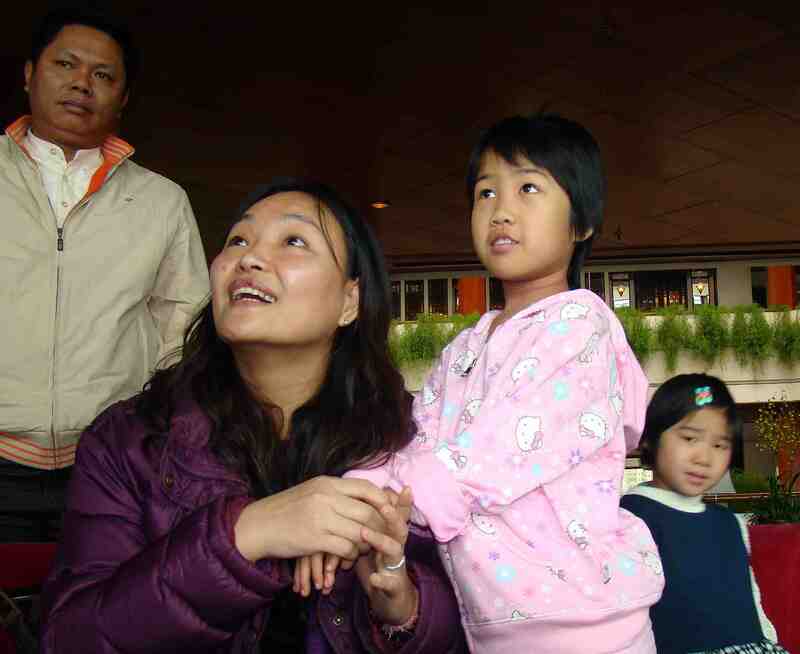 (In China, the law prohibits foster parents from adopting.) We are poignantly aware throughout the film that this foster family nurtured Faith for several years in China. This loving bond, her most significant source of attachment and love after her birthmother abandoned her, has been a healing anchor for Faith. The Sadowskys recognize that and welcome the foster family into their lives as well. In all, we marvel at the courage of the Sadowsky family to allow a camera to roll uncensored through this intimate and often raw experience. Some very difficult moments are captured and this is actually what gives this film its real force. When Faith does not get her way, she pitches a fit and says she wants to leave and return to China. When she struggles with carrying her books due to her impairment, she doesn’t ask for help and is scolded when they drop to the ground. At one point she blurts out to Donna “You are a white person and I am Chinese.” Adoptive mom Donna Sadowsky has a strong parenting style. She doesn’t always achieve immediate success but she is consistent, respectful and always listens to her children. We never doubt her love for Faith. As the film progresses, we witness the entire family trying to strengthen their bond with Faith and to protect her. In all, what emerges is a very realistic account of the hard work, self awareness and love it takes to pull adoption off on a daily basis. This is a deeply moving and intelligent film that probes the very heart of what family means while exploring issues of identity, cultural assimilation and bonding. “Wo Ai Ni Mommy” is part of the year’s 28th San Francisco International Asian American Film Festival, March 11-21, 2010, sponsored by the Center for Asian American Media (CAAM)San Francisco. It has also been selected for the prestigious PBS award-winning series Point of View. Screens— SUN 3.14 (3:30 PM, Kabuki, San Francisco), WED 3.17 (7:00 PM, Kabuki San Francisco).